Honor the Place of Isra'a And Miraj! "Exalted is He who took His Servant by night from al-Masjid al-Haram to al-Masjid al- Aqsa, whose surroundings We have blessed, to show him of Our signs. Indeed, He is the Hearing, the Seeing." 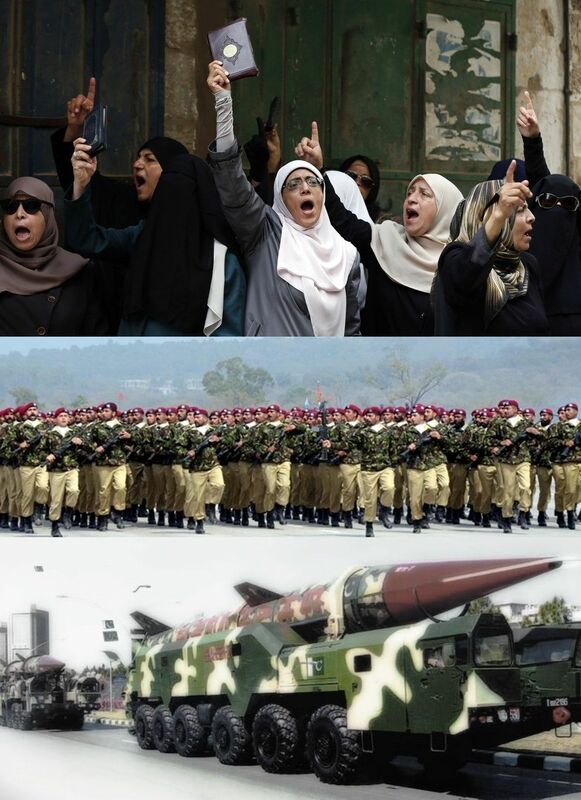 O Pakistan's Armed Forces! O Officers of Pakistan's Armed Forces! The support Al-Aqsa by its liberation and the liberation of all of Palestine is a duty upon you, you are the armed forces of the Muslims and you are not US Marines or the UN forces of Ban Ki-moon. It is the duty of the Muslim armies to secure the victory for Islam and Muslims, and their battle cry is for either victory or martyrdom Fee Sabeelillah. We know well that most, if not almost all, of you yearn to support Islam and fight the Jews and those who assist them. However, it is imperative that you must realize that traitors within the political and military leaderships have chained you to your barracks preventing you from mobilizing for the protection of your Deen and your sanctities. They are the ones who exploit you for brutal measure when they need you in their oppression of Muslims. Yet, they shackle your hands when you are inspired to fight the enemies of Islam and Muslims. And it is not far from your comprehension as to how these traitors have prevented you from giving a jaw breaking response that the Hindu state's aggression deserves. سر زمین اسراء اور معراج کی حرمت وتقدس بحال کرو! "پاک ہے وہ ذات جو کہ راتوں رات اپنے بندے کو مسجد حرام سے مسجد اقصی لے گیا جس کے ارد گرد ہم نے برکت رکھی ہے تاکہ اس کو اپنی قدرت کی کچھ نشانیاں دکھا دیں بے شک وہی ہے سننے والا اور دیکھنے والا"
"اللہ ان کو قتل کرے یہ کہاں بھٹکے جارہے ہیں"
"تمہاری اور یہود کی لڑائی ہوگی یہاں تک کہ پتھر بھی کہیں گے کہ اے مسلمان یہ یہودی میرے پیچھے ہے تو آؤ اور اس کو قتل کرو"
"اے ایمان والو! تمہیں کیا ہوگیا ہے کہ جب تم سے کہا جاتا ہے کہ اللہ کی راہ میں نکلو تو تم زمین سے چمٹ جاتے ہو؟ کیا آخرت کے مقابلے میں دنیا کی زندگی پر راضی ہو چکے ہو؟ آخرت کے مقابلے میں دنیا کی زندگی تو بہت کم ہے۔ اگر تم نہیں نکلے تو تمہیں درد ناک عذاب دے گا اور تمہاری جگہ کوئی اور قوم لائے گا اور تم اللہ کو کوئی نقصان بھی نہیں پہنچا سکتے اور اللہ ہر چیز پر قادر ہے"